breed well in zoos, which bodes well for their long-term survival. They use their tails for balance in the trees and group identification in long grass. Rival males also rub their tails on wrist and armpit scent glands and engage in injury-free ‘stink fights’ by waving their tails around! 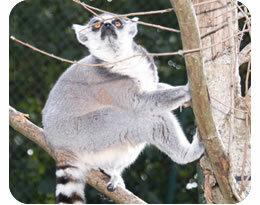 Ring-tailed lemurs love to keep warm so they often sunbathe, exposing as much of their stomachs to the sun as possible.